* On the back of the box of my game - "Synchronicity" is mispelled as: "Synchronity"! Box Text: "Always come back for seconds". - Synchronicity Time Battle: Synchronize your units to cast Song Magic! - Virtual Dive World: Interact with Reyvateils to unlock new skills! - Song Magic: The more you interact, the more powerful Song Magic you get! 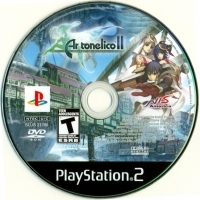 01-21-2014 ffmaniac2050 Description *This is the second game in the "Ar tonelico" Trilogy* * On the back of the box of my game - "Synchronicity" is mispelled as: "Synchronity"! 01-21-2014 ffmaniac2050 Box Text "Always come back for seconds". - Synchronicity Time Battle: Synchronize your units to cast Song Magic! - Virtual Dive World: Interact with Reyvateils to unlock new skills! - Song Magic: The more you interact, the more powerful Song Magic you get! 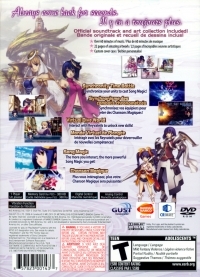 05-29-2012 disgaeniac Description *This is the second game in the "Ar tonelico" Trilogy* * On the back of the box of my game - "Synchronicity" is mispelled as: "Synchronity"! 05-29-2012 disgaeniac Box Text "Always come back for seconds". - Synchronicity Time Battle: Synchronize your units to cast Song Magic! - Virtual Dive World: Interact with Reyvateils to unlock new skills! - Song Magic: The more you interact, the more powerful Song Magic you get! This is a list of VGCollect users who have Ar tonelico II: Melody of Metafalica - Premium Edition in their Collection. This is a list of VGCollect users who have Ar tonelico II: Melody of Metafalica - Premium Edition in their Sell List. 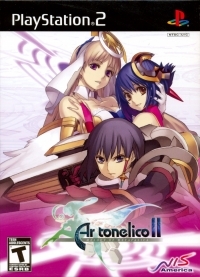 This is a list of VGCollect users who have Ar tonelico II: Melody of Metafalica - Premium Edition in their Wish List.